The Middle East is gearing up for the 2016 Dubai International Boat Show which takes place from 1-5 March. Last year, the show attracted more than 26,000 visitors from over 120 countries, and over 850 international, regional, and local exhibitors from more than 50 countries. This year's show is shaping up to be even bigger — take a look at the top yachts that you don't want to miss this time around: 1. Asya Heesen's 47 metre Asya, which was delivered to her owners in March 2015, will be on display at the show. 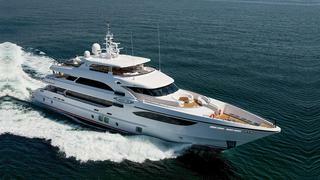 She is the second yacht in Heesen's restyled 47 metre class, which includes the spec-built superyacht Elena. Asya features exterior design from Omega Architects and interior design from Bannenberg & Rowell. She also has one of the best superyacht wine cabinets. “Although it is not vital to have a yacht on display, it is absolutely the key to success in any boat show - not only in this region," commented Heesen. "Being able to showcase your product to a potential customer makes a significant difference." The Middle East is gearing up for the 2016 Dubai International Boat Show which takes place from 1-5 March. Last year, the show attracted more than 26,000 visitors from over 120 countries, and over 850 international, regional, and local exhibitors from more than 50 countries. Heesen's 47 metre Asya, which was delivered to her owners in March 2015, will be on display at the show. 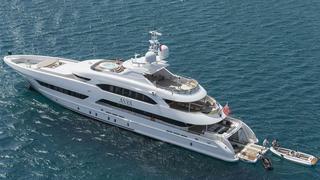 She is the second yacht in Heesen's restyled 47 metre class, which includes the spec-built superyacht Elena. Asya features exterior design from Omega Architects and interior design from Bannenberg & Rowell. She also has one of the best superyacht wine cabinets. “Although it is not vital to have a yacht on display, it is absolutely the key to success in any boat show - not only in this region," commented Heesen. "Being able to showcase your product to a potential customer makes a significant difference." Mondomarine's new SF40, Serenity, has just completed her first long voyage — the 4,500 mile trip from the yard in Savona, Italy to Dubai. She is the first yacht to be launched from the yard's new SF line, which is named after Mondomarine's Middle East dealer, SF Yachts. Exterior design is by Luca Vallebona of SF Yachts, while interior design comes from the Dubai-based designer Fatema Amaidan. Mondomarine's new SF40, Serenity, has just completed her first long voyage — the 4,500 mile trip from the yard in Savona, Italy to Dubai. She is the first yacht to be launched from the yard's new SF line, which is named after Mondomarine's Middle East dealer, SF Yachts. Exterior design is by Luca Vallebona of SF Yachts, while interior design comes from the Dubai-based designer Fatema Amaidan. United Arab Emirates-based Gulf Craft is getting ready for the Dubai International Boat Show 2016. It will present two highly-anticipated global premieres in its Majesty Yachts series. As well as announcing the new models, Gulf Craft will present a total of 14 yachts and boats, including the 41 metre semi-custom Majesty 135, the first of which was launched in 2012. Gulf Craft was founded in 1982 and builds yachts up to 47 metres in length under the Majesty Yachts, Nomad, Oryx and Silvercraft brand names. “We understand that our customers have different aspirations of what they would like to achieve on the water, and each of the new creations that we will be debuting at the Dubai International Boat Show will have something unique to offer," said Gulf Craft CEO Erwin Bamps. "As our home event, we are pleased to continuously support the show as part of the UAE’s vision to cement its position as a global player in the leisure marine industry.” Last year Gulf Craft launched its largest yacht yet, the Majesty 155. United Arab Emirates-based Gulf Craft is getting ready for the Dubai International Boat Show 2016. It will present two highly-anticipated global premieres in its Majesty Yachts series. As well as announcing the new models, Gulf Craft will present a total of 14 yachts and boats, including the 41 metre semi-custom Majesty 135, the first of which was launched in 2012. Gulf Craft was founded in 1982 and builds yachts up to 47 metres in length under the Majesty Yachts, Nomad, Oryx and Silvercraft brand names. 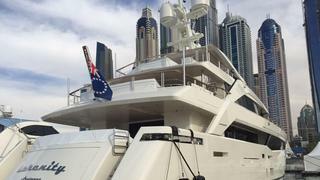 Last year Gulf Craft launched its largest yacht yet, the Majesty 155. Princess Yachts will be at the Dubai International Boat Show displaying a number of yachts across the Princess Flybridge range, including the updated design of the 26.8 metre Princess 88 Flybridge. The Princess 88 is an elegant and efficient popular pocket superyacht, which made its debut in 2013. Princess said, "Our 88 Motor Yacht personifies the finest qualities of Princess design and craftsmanship. Her unique deep-V hull design balances incredible fuel efficiency with breathtaking performance and agility. The vast flybridge and cockpit areas are exceptionally appointed for formal or social occasions. And from the saloon, at the touch of a button, a balcony unfolds over the sea, providing the perfect spot to enjoy a sunset." Princess Yachts will be at the Dubai International Boat Show displaying a number of yachts across the Princess Flybridge range, including the updated design of the 26.8 metre Princess 88 Flybridge. The Princess 88 is an elegant and efficient popular pocket superyacht, which made its debut in 2013. Princess said, "Our 88 Motor Yacht personifies the finest qualities of Princess design and craftsmanship. Her unique deep-V hull design balances incredible fuel efficiency with breathtaking performance and agility. The vast flybridge and cockpit areas are exceptionally appointed for formal or social occasions. And from the saloon, at the touch of a button, a balcony unfolds over the sea, providing the perfect spot to enjoy a sunset." Riva will be displaying its new coupé yacht, the 26.8 metre Riva 88 Domino Super. The new model was launched by the Italian boatbuilder in May last year, and in July Riva announced the sale of the first three hulls, including one in the Middle East. Riva said, “The new model is called ‘Super’ because it marks the evolution of the species. The 88ft Domino Super yacht immediately strikes the eye with its aerodynamic lines." It can reach a top speed of 38 knots, and the yard said it will "set new standards in the yachting sector in terms of style, comfort, and performance". 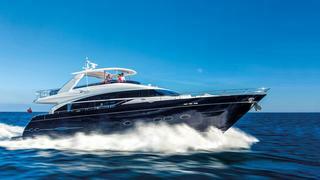 Riva will also present a range of other yachts, including the Riva 76 Perseo coupé, and the Riva 88 Florida. Riva will be displaying its new coupé yacht, the 26.8 metre Riva 88 Domino Super. The new model was launched by the Italian boatbuilder in May last year, and in July Riva announced the sale of the first three hulls, including one in the Middle East. Riva said, “The new model is called ‘Super’ because it marks the evolution of the species. The 88ft Domino Super yacht immediately strikes the eye with its aerodynamic lines." It can reach a top speed of 38 knots, and the yard said it will "set new standards in the yachting sector in terms of style, comfort, and performance". 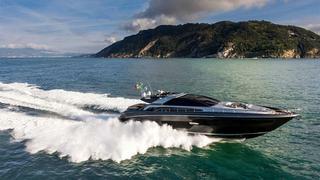 Riva will also present a range of other yachts, including the Riva 76 Perseo coupé, and the Riva 88 Florida.